Wargaming, Painting, Modelling, Reviews, Rants all at AP1! 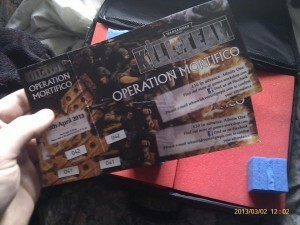 So i’v been horribly lax at writing blog posts so I thought i’d get a quick one up about the operation mortifico event myself and a mate are going to at warhammer world in April. Basically we had so much fun at the last kill team event that we are going to this one as well. This time round they have cut down a heap of the special rules you can take as it was a bit silly the last time with torrent meltaguns and psykers all over the place! This time round I am going to be taking my marine army I am working on. Although fun the last time the 30mins game time really was a pain for my crap ton of ork models so this time I am going for a more relaxing kill team to play with! Thats 200pts on the nose. Gonna give the speeder shrouded so he gets a sweet 3+ cover save when he moves owing to Jink! You can also split fire in this version of the kill team rules so he can dish out 6 s5 ap4 shots around. I was gonna take another landspeeder but realised you need the troops to capture the main objective and 5 marines would not cut it as you start taking LD tests when you reach 50% models. Scouts are there for variety and fun really, just love the idea of lone sniper scouts poping enemies from ruins. Not sure what i’m gonna use the other two special rules slots. Might give the marine heavy bolter blind for giggles and maybe make one of the scouts have something funny. Sons of Horus Legion Champion-Painted with a sponge!!! !